A couple months ago, one of the cats that lives in my garden had kittens. We're adopting out all of the kittens but one little guy really made a connection with us: Tubbs. He was whiniest, pickiest and roly-polyest of all the kittens, and the kids just loved him right away. His fur was like dense felt but short. He meowed ALL THE TIME, which I found annoying. But as soon as you picked him up, he'd snuggle in your neck and start purring. We adopted Tubbs and brought him inside to live with our other purry kitty, Adventure Kitty. 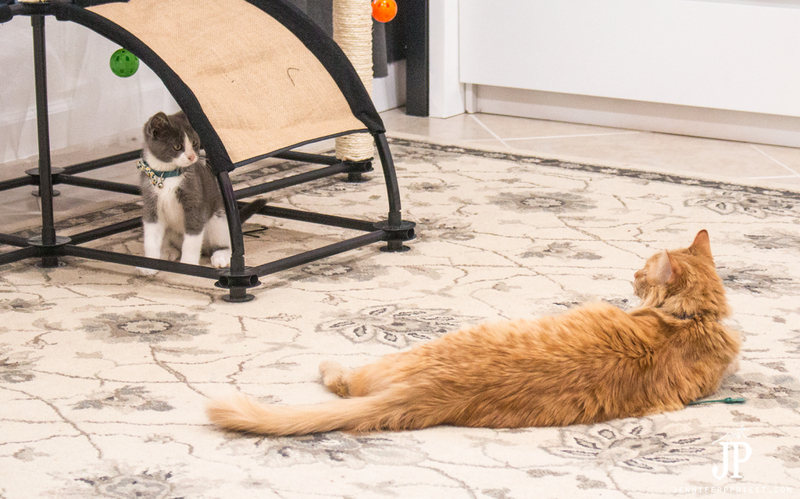 Here's the story of how to welcome a new kitten into the family. The kids left for the summer to stay with their grandma for a month on the east coast, about 3000 miles away. I didn't realize how much I was missing the kids until I started playing with Tubbs. The first day I brought him in the house, all he wanted to do was sit on me. Like, literally ON ME, all day. I took a nap and he slept on top of me the whole time. It only took him a few days to figure out how big the house was and where he could roam. It took about a week for him to stop crying all night for us to come out of our room to play with him. I am getting so much joy out of playing with Tubbs, learning his personality, training him to stay out of my potted plants (okay, maybe not “joy” from that) and teaching him how to interact with us. He now comes up to us and meows to be petted or to get picked up. And he comes up to me on the couch and snuggles if I am sitting there on my laptop or watching TV. He also runs away from me all the time, especially when I WANT to pick him up. You know how cats are … you can only pick them up when THEY want you to. I keep saying to my husband Xaver that, “Tubbs is so much fun!” He just rolls his eyes. But then he brought home this new kitty condo play gym and well, I knew he loved Tubbs too. Tubbs and Adventure Kitty got off to a rocky start. She's two years old and has been the queen of this castle for quite some time. It's been about 2 weeks since Tubbs “moved in” and she is finally starting to play with him and let him know who's boss. Cats are territorial so we set up a separate food and water station and litter box for Tubbs. At night, we kept him in a separate room from Adventure Kitty until she stopped hissing at him, which took about five days. He also wasn't litter trained so we needed to make sure he knew where the litter box was and how to use it before we just let him roam all night. Adventure Kitty's domain is my daughter Katie's room. She hangs out in my studio and the rest of the house but she retreats to Katie's room when she wants to be alone. Tubbs is forbidden from going into Katie's room. We discourage Tubbs from going places we don't want him to go by using water spray and saying the word, “No”. We want him to learn that when we say “No”, it means to stop doing the bad thing and move away. I have a small spray bottle that sprays a mist of water about 1 foot away. I use this to deter Tubbs from plants, Katie's room, and to discourage bad behavior, like trying to climb my curtains. After the first spritz, I now only need to spray the water in the air or pick up the water bottle and Tubbs knows he needs to stop and move away. To give him something to chew on, we got Tubbs a variety of toys and redirect him to play with those instead of chewing on my couch or scratching my rugs with his claws. Adventure Kitty also likes the food that comes along with a new kitten coming home. Since Tubbs is growing, I am feeding him Purina Pro Plan's outstanding wet foods. He's a growing boy! All formulas of Purina Pro Plan are high in protein and feature real meat, poultry or fish. Many of the Purina Pro Plan offerings include rice, vegetables, pasta and cheese. You can actually see the ingredients in the food! 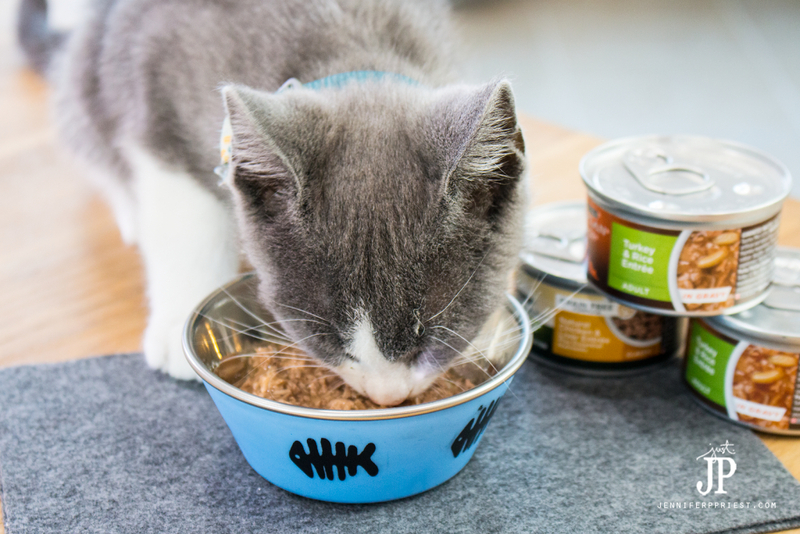 Did you know that a wet cat food is one way to make sure your kitty stays hydrated? In the wild, cats depend on prey as a natural source of hydration. An outstanding wet food, like Purina Pro Plan, can help cats stay hydrated while providing nutrition. Learn more about ways to keep your cats hydrated in this article: Healthy Hydration for Cats. Wet cat foods also help support a healthy immune system. 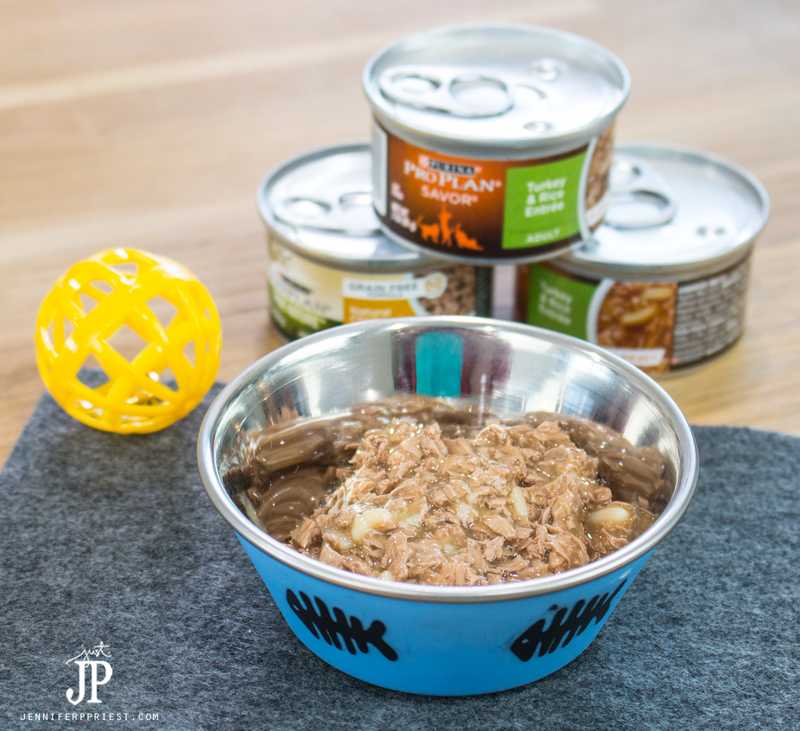 Purina Pro Plan has a wet cat food for every stage of your cats' life, from kitten to adult. Our cats coming running, yes RUNNING, when they hear me crack open the top of a Purina Pro Plan can of wet food. Not only is Purina Pro Plan nutritious and beneficial for your cat but you cat will love the taste and flavor as well. Since we started using Purina Pro Plan, Adventure Kitty's fur is the silkiest it has ever been! Plus, I've never seen the cats so excited about meal time as when I added Purina Pro Plan wet cat foods to their diet. Want your kitty to be this excited about a meal time you can also feel good about? Try Purina Pro Plan now! Get a coupon for Buy 5 cans, get 1 free on the website. Click the link to register and you'll get the coupon to try the food today. Tubbs is so pretty and I absolutely love the name! It looks like he’s thoroughly enjoying his new home. Awww, what a cutie! 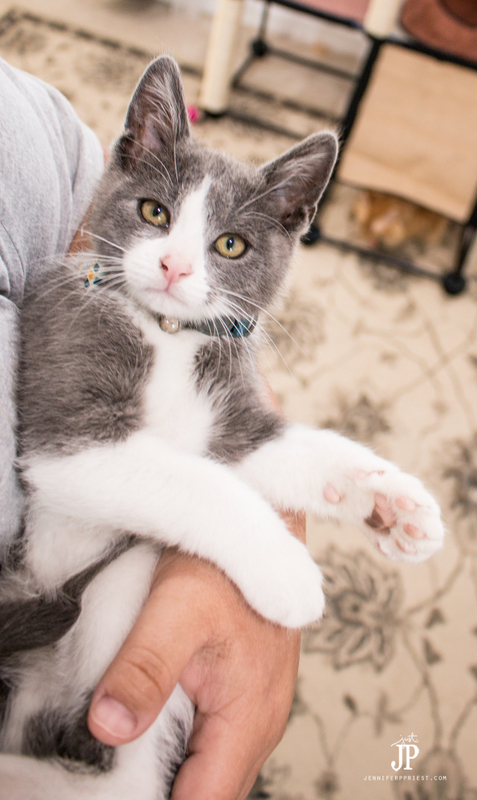 <3 You're awesome for rescuing Tubbs and finding homes for all the other kittens! <3!